Artist's illustration of Hempsell Astronautics' proposed Necropolis space-junk cleanup system in Earth orbit. The U.S. Space Surveillance Network currently tracks some 18,000 objects larger than 4 inches (10 centimeters), of which only 1,200 are intact, operational satellites. In addition to that, there are 750,000 so-called "flying bullets" about 0.4 inches (1 cm) in size and around 150 million fragments smaller than 1 millimeter. Even if everyone complied with the regulations, it still wouldn't be enough, experts say. According to Satomi Kawamoto, of the Japan Aerospace Exploration Agency (JAXA), more than 100 objects need to be removed from LEO at the rate of five per year to stop the proliferation of fragments resulting from in-orbit collisions and explosions. Here are some of the debris-removal concepts presented at the 7th European Conference on Space Debris. British firm Hempsell Astronautics has proposed a system dubbed Necropolis that would collect defunct geostationary satellites and deliver them to a single spot in the so-called "graveyard orbit." This area is situated a few hundred kilometers above the roughly 22,000-mile-high (36,000 km) geostationary ring. 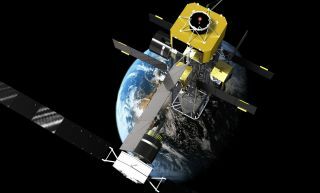 Necropolis would consist of two spacecraft: a Hunter, which collects other spacecraft and pushes them up away from the geostationary ring, and a Terminus, the final parking spot for the no-longer-needed satellites. Hempsell Astronautics said the strategy would be more sustainable than the current rather chaotic use of the graveyard orbit. The Hunter spacecraft would reuse technology developed for ESA's BepiColombo Mercury mission. In another proposal, a team from the University of Colorado Boulder envisions pushing defunct spacecraft away from the crowded geostationary ring without even touching them. This concept would use a "pulsed electron gun," an intermittent electron beam of several tens of watts of electrical power. Europe will soon launch its RemoveDEBRIS demonstrator mission to deorbit two experimental cubesats from the 250-mile (400 km) altitude using a net, a harpoon and a drag sail. A chaser satellite will release the experimental pieces of space junk, one of which will be captured by a 16.5-foot (5 meters) net tethered to the chaser. The harpoon system will be tested on a fixed target. The chaser satellite will then use a drag sail to bring itself to a faster re-entry. It is expected to burn up in the atmosphere in 2018. In the future, cubesats scattered around Earth orbit could be collected and disposed of by a spacecraft fitted with "shape memory alloy tentacles" developed by Louis Wei-yu Feng, a student at the University of Cape Town in South Africa. The tentacle hand, dubbed MEDUSA, is made of nitinol, a material that can switch from molten to solid state multiple times, giving the collector spacecraft countless chances to grasp an out-of-control tumbling cubesat. Wei-yu Feng said that MEDUSA has a clear advantage over one-shot solutions such as harpoons or nets. JAXA said it envisions using electrodynamic tethers to remove spent rocket stages from LEO. (Rocket upper stages account for 18 percent of all tracked objects in Earth orbit, experts have said.) JAXA's Kawamoto said that because of these objects' smooth and regular shapes compared to satellites, they represent an ideal target for early removal attempts. Electrodynamic tethers generate magnetic drag, which is stronger than air drag and could take down a large piece of debris from orbit within a year, Kawamoto said. The conductive tether generates thrust as it interacts with the Earth's electromagnetic field and doesn't require an additional power source. JAXA's experiment to test the technology earlier this year, however, didn't succeed; the tether failed to deploy properly from Japan's HTV-6 International Space Station resupply spaceship. But capturing an uncooperative object that might be tumbling uncontrollably is extremely challenging. In the worst-case scenario, the removal spacecraft could itself hit the mega junk. ESA, however, said it aims to demonstrate that such a feat is feasible by launching a mission called e.Deorbit in 2023. The likeliest target of the e.Deorbit mission will be the 85-foot (26 m) Envisat satellite, which went silent in 2012. Orbiting at less than 500 miles (800 km), Envisat would take more than 150 years to deorbit naturally. Throughout this period, the former remote-sensing satellite would force operators of hundreds of spacecraft in this congested region to perform regular avoidance maneuvers. If hit by an object of only 22lbs. (10 kilograms), Envisat would disintegrate into a cloud of dangerous space rubble, experts said. E.Deorbit, the first mission of its kind, will use either a net or a robotic arm with a gripper to catch the satellite. Subsequently, e.Dorbit will use its own propulsion unit to steer the catch into the atmosphere, where both satellites will burn up.